Our newest and largest directory, EveryDentist.com, allows you to search for a dentist in your area. You also have the option of searching by specialty. We include General Dentists, Periodontists, Endodontists, Orthodontists, Pediatric Dentists, Prosthodontists, and Oral and Maxillofacial Surgeons. 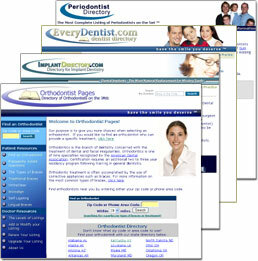 The purpose of OrthoPages.com is to give you more choices when selecting an orthodontist. We currently list over 3000 private practicing orthodontists in the United States and Canada. Normally, getting a dental implant takes the work of two dentists. First a dental surgeon (usually a periodontist or oral surgeon) places the dental implant post into your jawbone. Then a restorative dentist (usually your general dentist or a prosthodontist) places a dental crown on top of this dental implant post. Dental implants can also be used to anchor bridges, partials and dentures. ImplantDirectory.com lists over 7800 dentists in the United States who place or restore dental implants. Periodontists are dental specialists with advanced training in the diagnosis and treatment of gum disease and other gum problems. They also provide dental implants to replace missing teeth.